From Now On & The Greatest Showman Lent Study Bundle by Rachel Mann was published by Eden bundles in January 2019 and is our 5216th best seller. 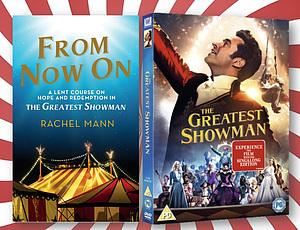 The ISBN for From Now On & The Greatest Showman Lent Study Bundle is EDENBUNDLE-2263. Be the first to review From Now On & The Greatest Showman Lent Study Bundle! Got a question? No problem! Just click here to ask us about From Now On & The Greatest Showman Lent Study Bundle. A:The How to Use Guide at the start of the book does recommend a copy for each participant. There are a few pages to read at the beginning of each week, sections to work through and Looking Ahead sections to wrap up and expand upon the content covered. There is one Study Guide in the Bundle, but we also offer them individually at this link: https://www.eden.co.uk/shop/from-now-on-4559215.html Or Packs of 5 which gives you a saving of over £5. https://www.eden.co.uk/shop/from-now-on-dlt-lent-book-for-2019-pack-of-5-4957179.html Thank you for using Q&A Forum.